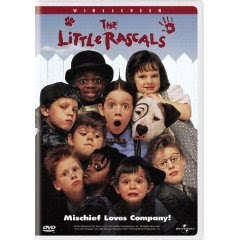 For our Friday Night Movie Night this week we watched the movie Little Rascals. I loved this movie when I was little and just happened to be talking to a friend about this movie recently and how I needed to find a copy from someone so I could watch it with my kids. Well on Monday I made a trip to Deseret Industries (a thrift store) to search for some treasures that I could transform for Christmas Presents and I happened upon a woman putting out some VHS tapes that had just been donated. Now I do not discriminate against VHS. I love VHS and DVD's equally, although DVD's do take up less space :> Well anyways, I was able to find 5 movies that I didn't currently own on either DVD of VHS and have been wanting for a long time. I got Disney's Pinocchio, Disney's The Rescuers Down Under, Anastasia, The Little Rascals, and The Muppet's Christmas Carol (now under the tree for Christmas). All five movies were just $1 each. I love thrift stores and loved being able to share this movie with Bubba nd Miss Priss for our Friday Night Movie Night.